Screenshots. Once impossible on a non-rooted android, it’s built into the operating system in Android 4 and above. Just hit a couple of keys and you’re done. 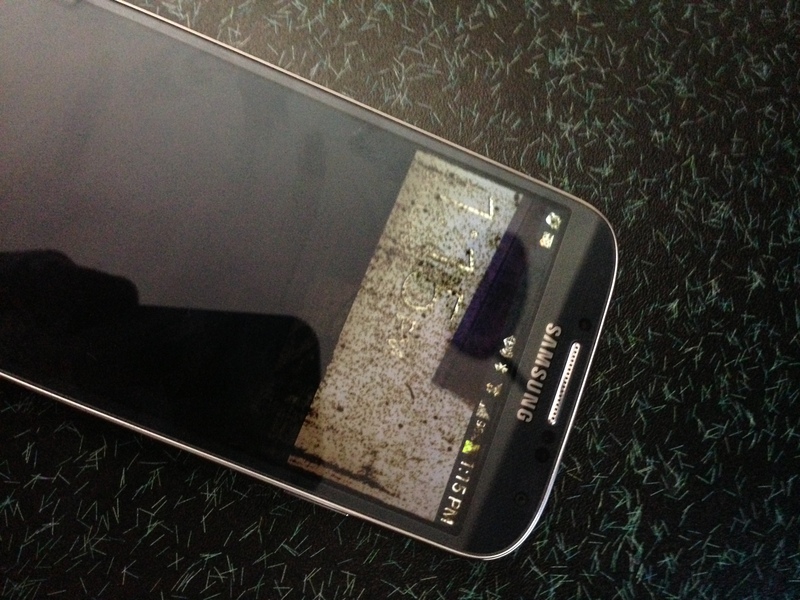 For the S4, you need to hit “The Button”, and the power button silmultaneously. Then I simply drop the image into dropbox and I have it on the PC. Seems the only reason I need to root the phone, is to edit the hosts file. I’ve also figured out I’ve been barking up the wrong tree as far as accessing files on the phone, PC-Style. Every little app has a confusing place it’s saving files on the phone. I have a hard time getting them onto the SD card – except for the camera. So it’s time to use Dropbox some more, and use *that* as the primary storage item. I’m having an easy time putting videos and books, etc, onto Dropbox and then accessing them via the phones apps. I was trying to figure out how to add enough content to this post, until I go on a hike with my son. We walk a couple of miles and I sat down on a concrete bench. We head home. And I try to access my phone, and find it cracked. The screen is unusable, except to tell the time. Panic ensues. It got worse by the time I took this picture. Can’t even read the time at the top. Now I’m wondering what in the hell have I bought – a phone so fragile you can’t keep it in your pocket ? What’s the point of having something so fragile ? Seems it’s time to buy a really strong protective case. Either that, or Mr. Verizon is trying to sell me an Otter Box. This case seems perfect – including a slide-out physical keyboard which would seem to make the phone **absolutely perfect** (at least as far as operating it). So I head to Phoneclaim.com and file a claim. That’s an interesting setup they have, just a series of web forms and your claim is filed. It’s very slick, and easy when it all comes down to it. I was a bit uncomfortable with sending a JPG of my drivers license to them, but after ruminating on it I just said “Screw it” and went ahead and sent it. They say that I get a new phone by the next day, after the claim is approved. Claim was submitted, and I am supposed to wait for an email or something in the next three hours. It only took one hour. The automated process claims the phone is being shipped by next day shipping. I think I should expect it by Tuesday. With the successful purchase of the Galaxy S4, I set to work on exploring the real fun features – anything remotely geeky. After the simple process of rooting it was over, the question was – what can I do now that it’s rooted ? First and most obvious thing to do was install a hosts file. You can do this very complex, by downloading files and paying attention to a whole host of people on the internet dedicated to wiping out every ad that was ever seen. Or buy Adblock. Or, on a PC anyway, just open up a file and make some entries based upon whatever ad annoys you. This is the method I employ. Just blocking Doubleclick gets rid of 3/4 of ads anyway. But you can’t do that on a smartphone – the developers are worried about DNS hijacks, so you can’t get access to the root. Unless you have unlocked root access, that is. So the question is, how to do so ? I started by googling and the How To Geek had some recommendations. His were bad – I couldn’t gain write access to the stupid hosts file, even though I could find it in the file structure on the device. After installing the Android Debugging Kit and following a lot of Linux-flavored advice, I saw a mention of an app on the phone to do the same thing. Bert Cotton’s Hosts Editor. Thanks Bert. Next thing to do will be take a screenshot with the phone. I do not understand why you can do this with an Iphone, but not an Android, but the rumor is you can do it after rooting the phone. Any ideas, gentle reader ?